One of the most important historical and cultural developments in Judaism during the Hellenic period was the formation of the movement, during the late third century B.C.E., that later became the Hasidim. Very little is known of the origins of the early Hasidim themselves. The book of 1 Maccabees makes the first reference to the existence of the ’Ασιδαῖοι (Hasidaioi) as a body of religious people. It is politically interesting that Simeon II—the person to whom the Pharisees, who were so strongly against Greek culture, admit owing so much—was from the Zadok line of high priests and from a family who thought so highly of Greek culture. It was Simeon II and his family of Levitical priests who not only favored Hellenistic culture but wanted to bring Judaism in line with the philosophies and views of the modern world of their own time. It further points to the fact that the early Hasidim, prior to the Hasmonaean revolt, were attempting to reach a form of piety through Greek-like methods, which explains why they were Stoic and ascetic in their approach. The Great Synagogue consisted of 120 elders, including many prophets, beginning with those who came up from their Babylonian exile with Ezra in the mid-fifth century B.C.E.13 This august body broke up in 227/226 B.C.E. upon the outbreak of hostilities at the death of Onias II, the father of Simeon II. By their writings, Moses and many of the other prophets of Yahweh clearly prove that they did not adhere to the oral regulations later espoused by the Hasidim (later to become the Pharisees, Essenes, etc.). It is also impossible that the conservative scribe Ezra or any of the other prophets of Yahweh associated with him held to any of these oral laws. On the other hand, some 230 years after Ezra and the formation of the Great Synagogue, and over 100 years after the conquest of Judaea by Alexander the Great, we arrive at the last period of the Great Synagogue. A different climate now prevailed. The divisions among religious leaders at that time and their favorable attitude toward Greek philosophy and culture offered the fertile ground upon which new ideas could grow. Phillip Sigal speaks of the third century B.C.E., the era which gave rise to Simeon II, as the period of the origination of the oral law. Therefore, the specific mention of Simeon II as the recipient of the oral laws from the Great Synagogue is of utmost importance. He had in fact jointly served as high priest with his father during the last years of the Great Synagogue and would certainly have been part of that body. Jewish legend has this priest accompanied by the incarnate deity into the Holy of Holies.18 In this way the Pharisees made their founder both priest and prophet. After the death of Onias II, the Great Synagogue broke up and Simeon II led the “remnant” of that group.19 Here the truthfulness of the history of the oral laws takes its beginning. The Mishnah is nothing less than the written codification of the oral laws as they came down and were modified through the hands of the Pharisaic branch of the Hasidim. At the same time, the more anti-Hellenic and conservative branch of the priests (the Sadducees) were certainly right in their claim that the oral laws were never given by Moses and transmitted down by the prophets to the Great Synagogue. This self-aggrandizing claim gradually moved the early Hasidim and their offshoots the Pharisees, Essenes, and others, away from the strict guidelines of the Old Testament and the early traditions of the Levitical priests. At the same time, they used Greek philosophical methods as a vehicle to more strictly observe the Torah. It can therefore be concluded that the high priest Simeon II (225–206 B.C.E.) and the people he gathered around him, particularly from the class of scribes and scholars, not only founded the group that later became the Hasidim (pious ones) but were the originators and gatherers of the initial traditions (oral laws) later followed by the Pharisees. It was the Hasidim, guided by the scribes who filled their ranks, who not only brought into effect many new principles with regard to the Torah in order to “build a fence around the Torah” but also borrowed and incorporated many thoughts, premises, and interpretations used by the Greeks and other pagan societies. Among these practices were stoicism, the unutterable sacred name doctrine, and adherence to oral traditions—all in the name of becoming more pious by more strictly observing the Torah. The theory went that if one should work right up to the time of the Sabbath he “might” err and work beyond sunset and break the Sabbath. By addressing such scriptural issues in this stoic fashion, the Hasidim believed it made them more pious. There can be little doubt that this text was produced to provide some kind of written authority for the Hasidic observance, authority which is lacking in any oral tradition. 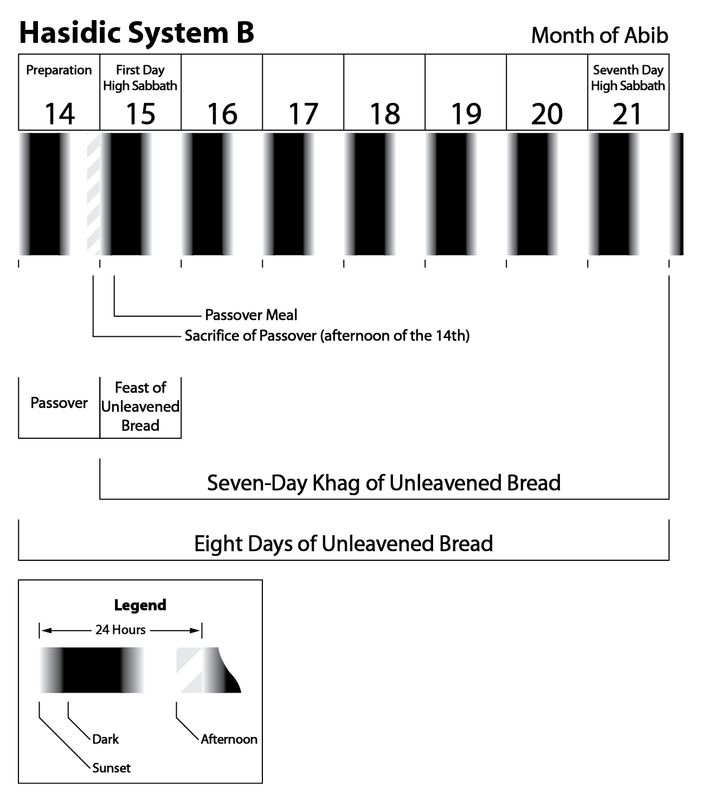 The book of Jubilees is in fact the earliest known record of this Hasidic interpretation and method of Passover observance. From the days of Alexander the Great (332 B.C.E.) until the Hasmonaean revolt (167 B.C.E.) a great deal of Greek philosophy, thought, and ideas had entered Judaism, especially into the ranks of the scribes and priests who formed the Hasidic movement. These foreign ideas had become so strongly incorporated into the culture and religion of Judaism that, by the mid-second century B.C.E., they were no longer viewed by the Hasidim as alien but, somehow, had become completely Jewish. It would be unrealistic and naive to believe that Greek dominance of Judaea, during the centuries after the conquest of Judaea by Alexander the Great, had no effect on the religious, philosophical, and cultural views of the various Jewish sects of that period. As we proceed with our examination of the origin of the views held in System A, System B, and System C, it will be of great assistance if we keep in mind the context of this historical and cultural background from which the opposing Jewish schools sprang. That is all for the “Dark Period” everyone. Be on the lookout for our next installment titled 10. 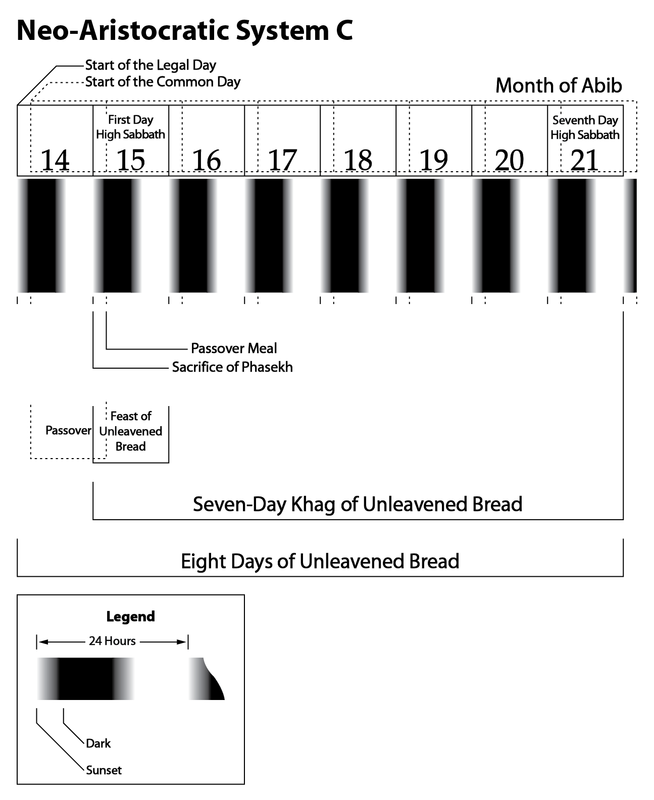 Passover – Sadducees & Pharisees I. 1 NBD, pp. 505, 981; MDB, pp. 263, 680, 785, 980; EBD, pp. 351, 465, 824. 4 1 Macc. 2:42, 7:13; 2 Macc. 14:6. 6 Ab. 1:2. Also see JSMIA pp. 348ff; HCJ pp. 79ff, 437, n. 111; NBD p. 46. 7 Jos. Antiq., 12:4:10; B. Yom., 69a; schol. Meg. Taan. ; Tosef. Sot., 13:6–8; J. Yom., 43c; B. Yom., 39a, b; B. Men., 109b. Some hold to the possibility that this Simeon the Just could also be Simeon I (e.g., TNTB, p. 140; Danby, Mishnah, p. 446, n. 6). Yet, there is no event in the time of Simeon I that would account for the breakup of the Great Synagogue, a political body to which the high priest was automatically considered a leading member. On the other hand, about the time of the death of Onias II, the father of Simeon II, hostilities and civil war broke out among the Jews over their leadership (Jos., Antiq., 12:4:10-12:5:1). This civil war would have been a direct cause for the disbandment of the Great Synagogue. 8 ECJ, 1.2, p. 19. 9 Simeon II (the Just) was the son of Onias II (Jos. Antiq., 12:4:10), the son of Simeon I (the Just) (Jos. Antiq., 12:4:1, 12:2:5), the son of Onias I (Jos. Antiq., 12:2:5), the son of Jaddua (Jos. Antiq., 11:8:7), the son of Jonathan (Johanan) (Jos. Antiq., 11:7:2; Neh. 12:10, cf., 12:22-23), the son of Joiada (Jos. Antiq., 11:7:1, 2; Neh. 12:22, cf., 12:10-11), the son of Eliashib (Jos., Antiq. 11:7:1; Neh. 12:10), the son of Joiakim (Jos., Antiq. 11:5:5; Neh. 12:10), the son of Yahushua, the high priest of Yahweh at Jerusalem after the return of the Judahites from their Babylonian exile (Jos., Antiq. 11:5:1; Neh. 12:10). All of the above performed as the high priest at Jerusalem. Yahushua was the son of Jozadak, the son of Seraiah—Seraiah being of the Zadok line and the last high priest of the first Temple of Yahweh before it was destroyed by the Babylonians (2 Kings 25:18; 1 Chron. 6:14; Jer. 52:24-27; Ezra 3:2, 8, 5:2, 10:18; Neh. 12:1-2, 8-11; Hag. 1:1, 12, 14, 2:2, 4; Zech. 6:11; Jos. Antiq. 10:8:5, 6:11:3-10, 20:10:2). 10 NBD p. 505; SCO, p. 20. 11 ECJ 1.1, p. 151. 13 Danby, Mishnah, p. 446, n. 5. 16 Jer. 10:1-8; Matt. 15:1-14, 16:6, 23:1-3, 13-39; Mark 7:1-13, 8:15; Luke 12:1; Gal. 1:11-17, cf., Acts 23:6; Titus 1:12-15. 17 ECJ, 1.1, p. 151. 20 NBD p. 46; EBD p. 954. Joshua ben Sirach was a scribe and sage who worked in an academy located at Jerusalem. In the Hebrew version of Ecclus., 51:129, a blessing is given on the “sons of Zadok.” This favorable attitude toward the house of Zadok (Tsadoq) reflects the fact that Joshua was on the Essene side of the Hasidic spectrum. 26 1 Macc. 7:4-22; Danby, Mishnah p. 446, n. 7. 28 CBTEL 9, p. 235. 29 In the B. Erub. 21b (cf., J. Ber. 1:5, 3b) we read this warning from the sages, “My son. Be more heedful of the words of the sofrim (scribes) than of those of the written Torah. For the words of the Torah contain positive and negative injunctions (for the transgression of which there is no death penalty) but whoever transgresses the words of the scribes incurs the penalty of death.” Sanh. 11:3, states, “Greater stringency applies to (the observance of) the words of the scribes than to (the observance of) the words of the (written) Torah.” Cf., Ab. 1:1; TNTB p. 140; Danby Mishnah pp. xvii, 446, n. 2; EJ 15, p. 81. 30 HJP 2, pp. 412f. 32 HUCA 54, p. 128; DR 13; B. R.Sh., 9a. Also see the discussion in SJC chap. xvi. 33 OTP 2, pp. 43–45; THS p. 283. This entry was posted on 01/12/2013, 10:25 am and is filed under Calendar, Feast Days, Passover, Religion, Unleavened Bread, Yahshua, Yahushua, Yahweh. You can follow any responses to this entry through RSS 2.0. You can leave a response, or trackback from your own site.